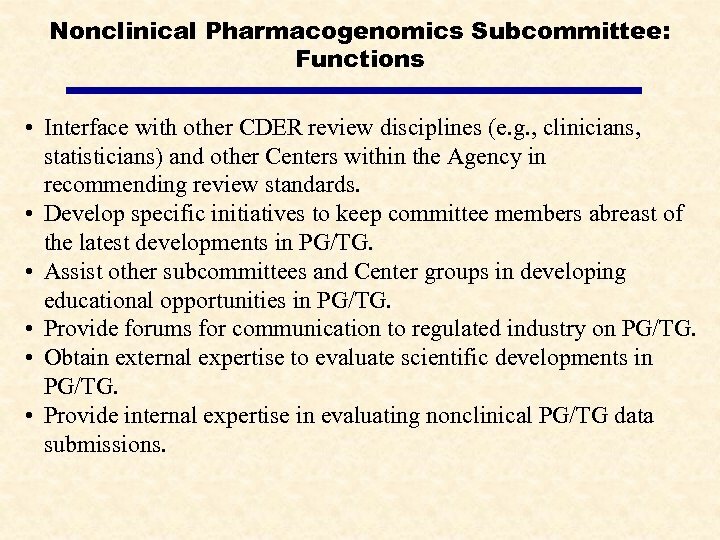 Nonclinical Pharmacogenomics Subcommittee: Functions • Interface with other CDER review disciplines (e. g. , clinicians, statisticians) and other Centers within the Agency in recommending review standards. • Develop specific initiatives to keep committee members abreast of the latest developments in PG/TG. • Assist other subcommittees and Center groups in developing educational opportunities in PG/TG. • Provide forums for communication to regulated industry on PG/TG. • Obtain external expertise to evaluate scientific developments in PG/TG. • Provide internal expertise in evaluating nonclinical PG/TG data submissions. 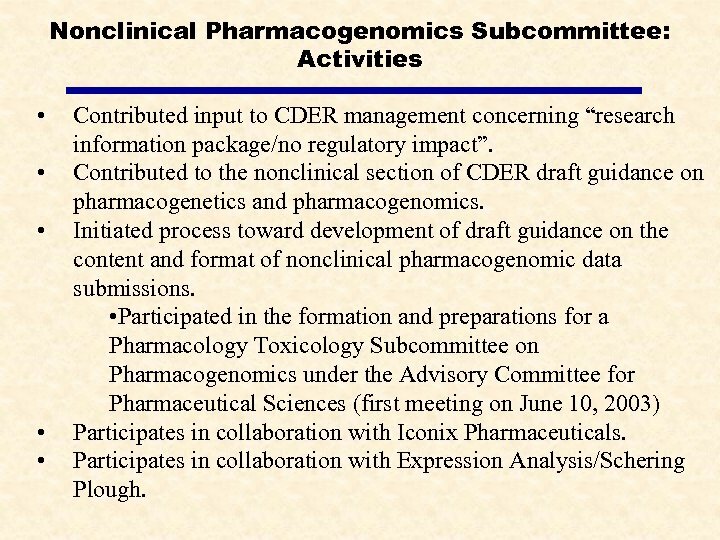 Nonclinical Pharmacogenomics Subcommittee: Activities • • • Contributed input to CDER management concerning “research information package/no regulatory impact”. 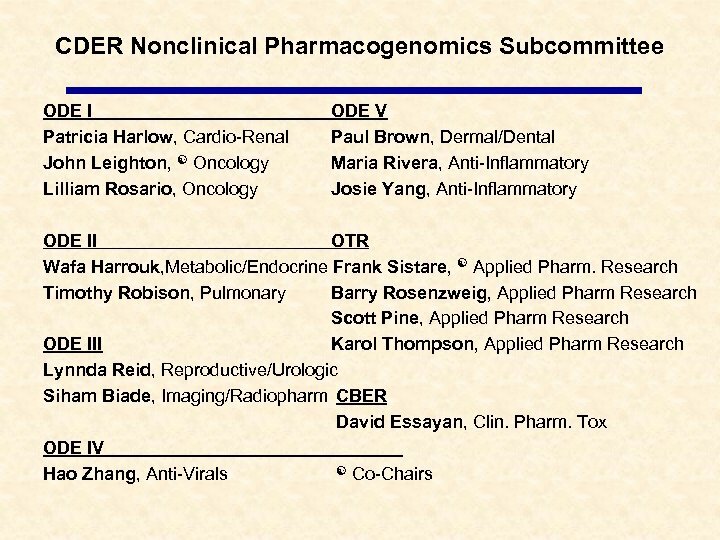 Contributed to the nonclinical section of CDER draft guidance on pharmacogenetics and pharmacogenomics. 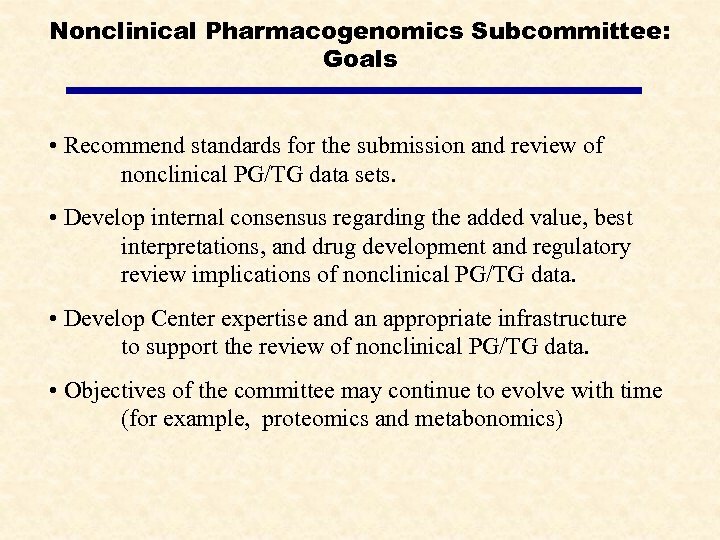 Initiated process toward development of draft guidance on the content and format of nonclinical pharmacogenomic data submissions. 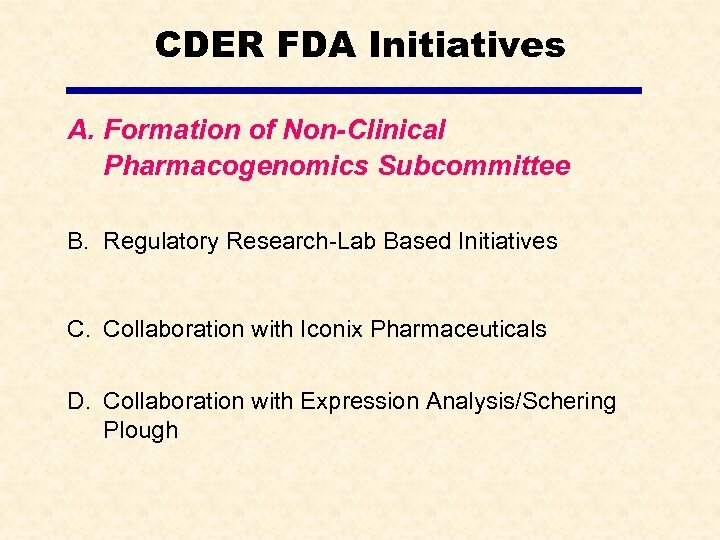 • Participated in the formation and preparations for a Pharmacology Toxicology Subcommittee on Pharmacogenomics under the Advisory Committee for Pharmaceutical Sciences (first meeting on June 10, 2003) Participates in collaboration with Iconix Pharmaceuticals. 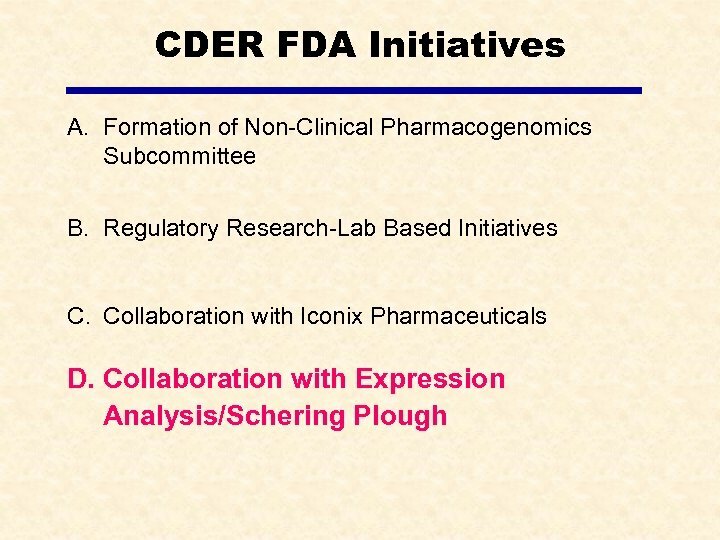 Participates in collaboration with Expression Analysis/Schering Plough. 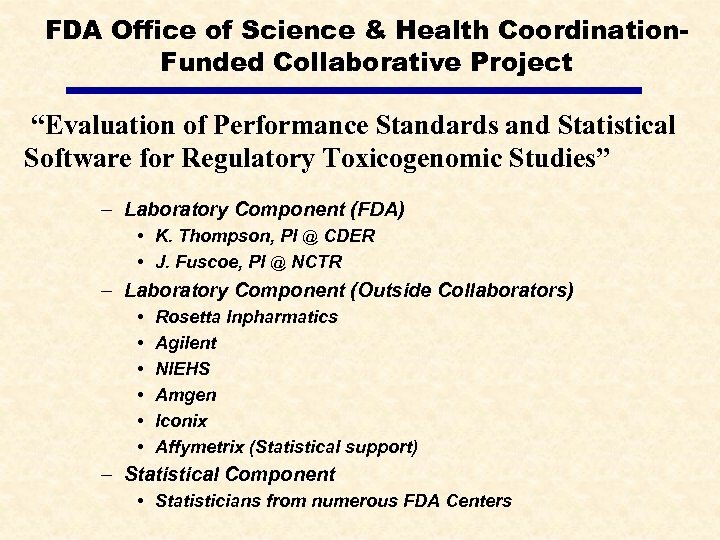 FDA Office of Science & Health Coordination. 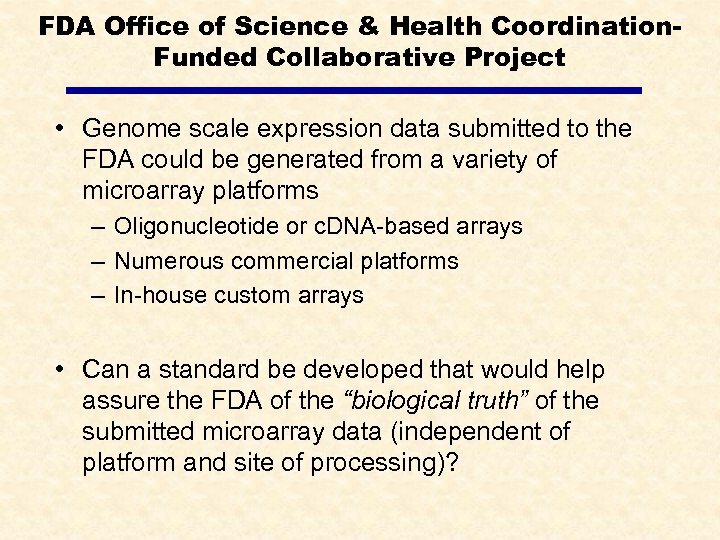 Funded Collaborative Project • Genome scale expression data submitted to the FDA could be generated from a variety of microarray platforms – Oligonucleotide or c. DNA-based arrays – Numerous commercial platforms – In-house custom arrays • Can a standard be developed that would help assure the FDA of the “biological truth” of the submitted microarray data (independent of platform and site of processing)? 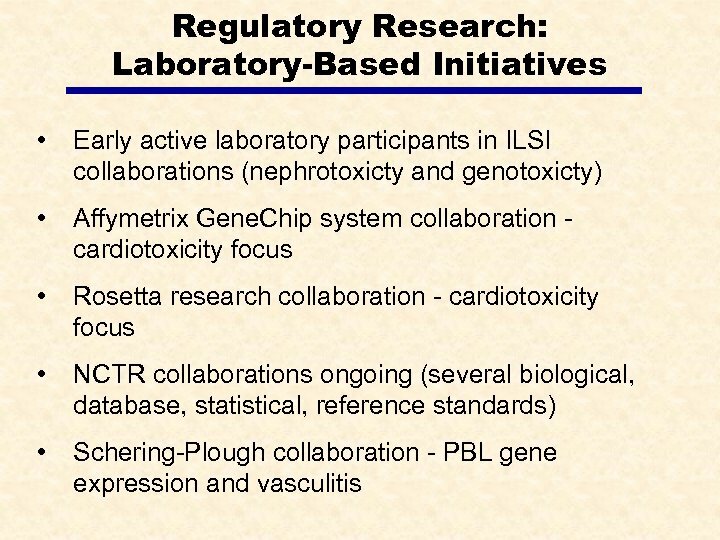 Collaboration with Iconix Pharmaceuticals • Provides research access to Drug. 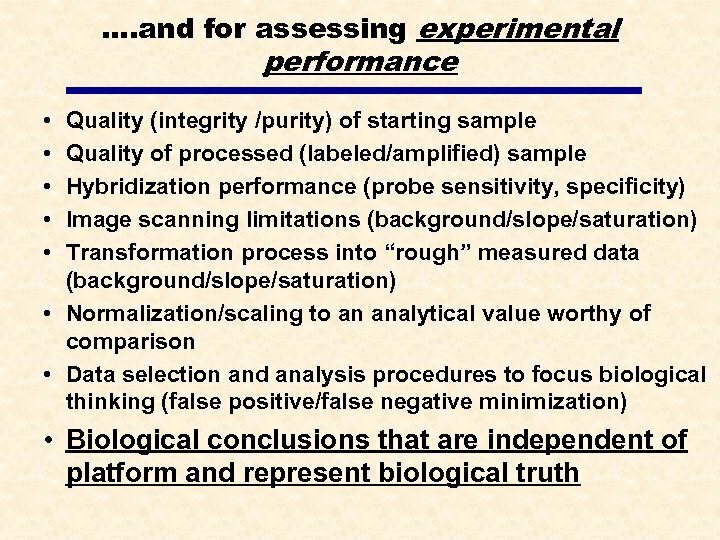 Matrix™ system for evaluation purposes. 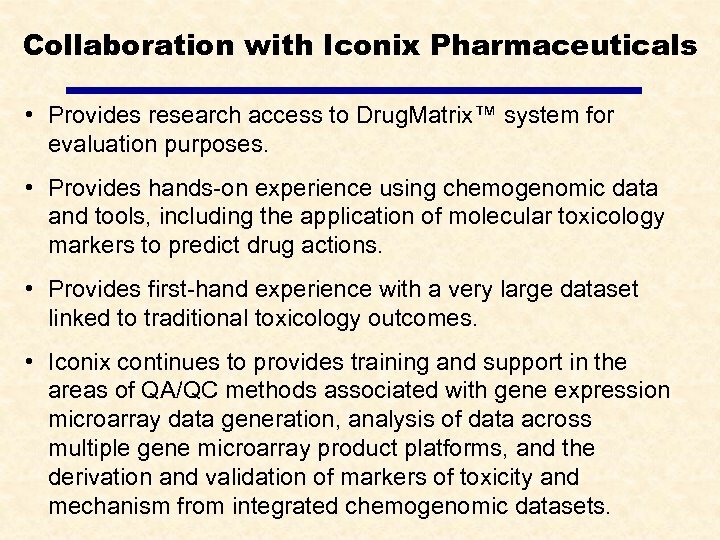 • Provides hands-on experience using chemogenomic data and tools, including the application of molecular toxicology markers to predict drug actions. • Provides first-hand experience with a very large dataset linked to traditional toxicology outcomes. 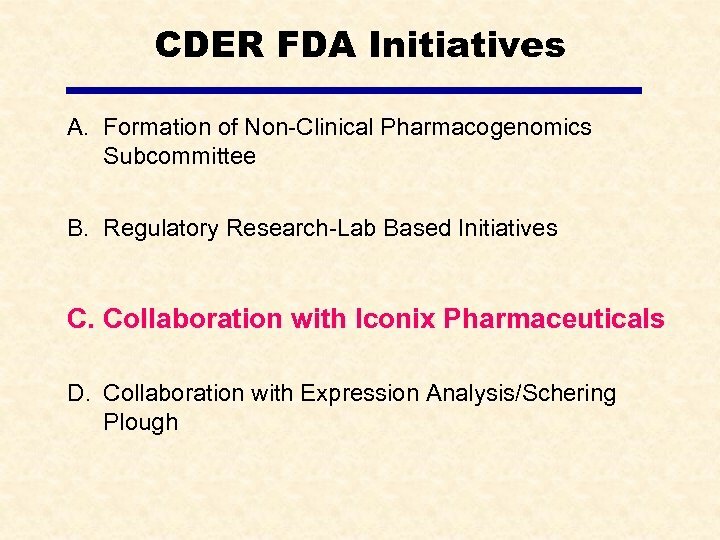 • Iconix continues to provides training and support in the areas of QA/QC methods associated with gene expression microarray data generation, analysis of data across multiple gene microarray product platforms, and the derivation and validation of markers of toxicity and mechanism from integrated chemogenomic datasets. 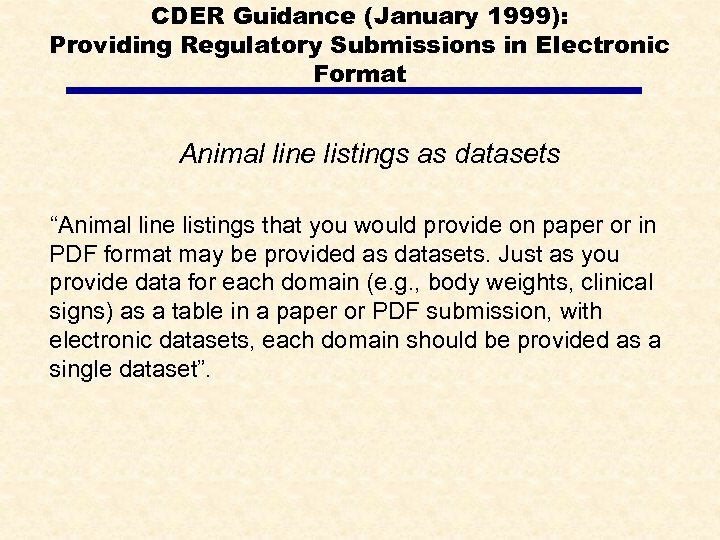 CDER Guidance (January 1999): Providing Regulatory Submissions in Electronic Format Animal line listings as datasets “Animal line listings that you would provide on paper or in PDF format may be provided as datasets. 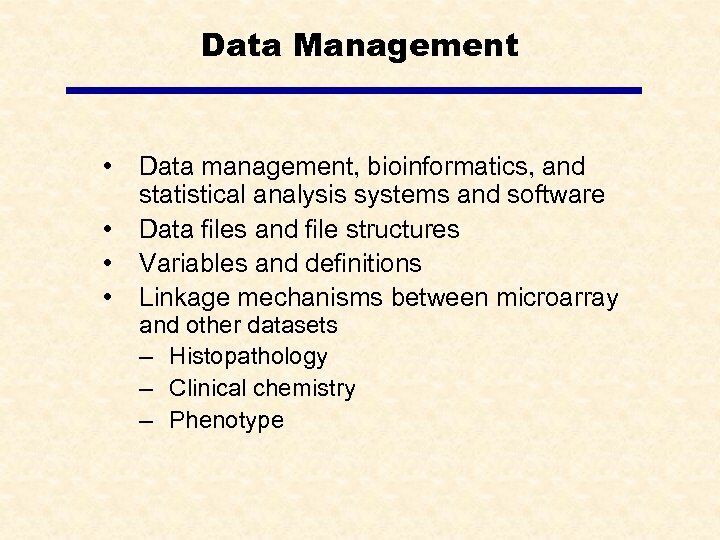 Just as you provide data for each domain (e. g. , body weights, clinical signs) as a table in a paper or PDF submission, with electronic datasets, each domain should be provided as a single dataset”. 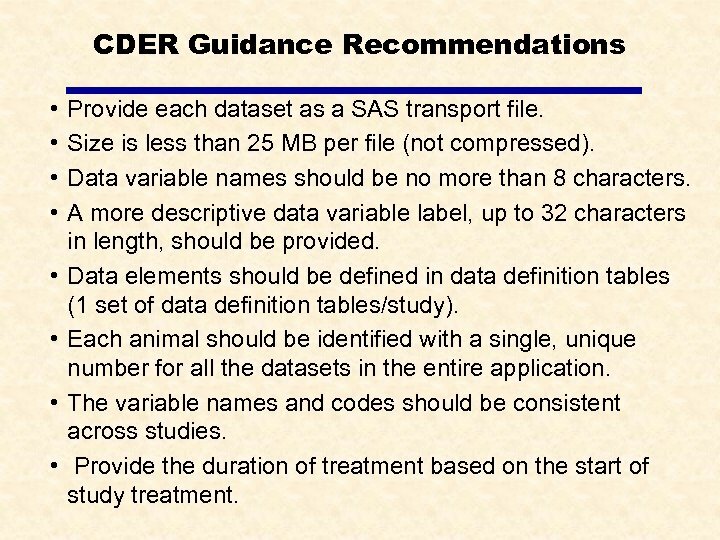 CDER Guidance Recommendations • • Provide each dataset as a SAS transport file. Size is less than 25 MB per file (not compressed). Data variable names should be no more than 8 characters. A more descriptive data variable label, up to 32 characters in length, should be provided. 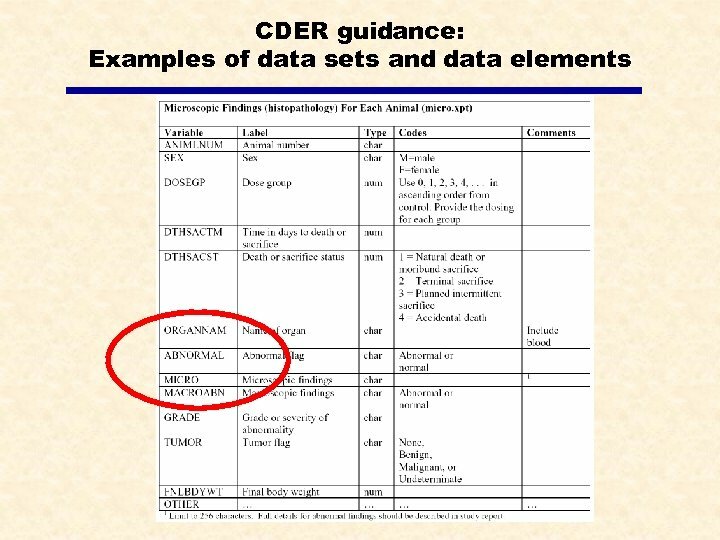 Data elements should be defined in data definition tables (1 set of data definition tables/study). 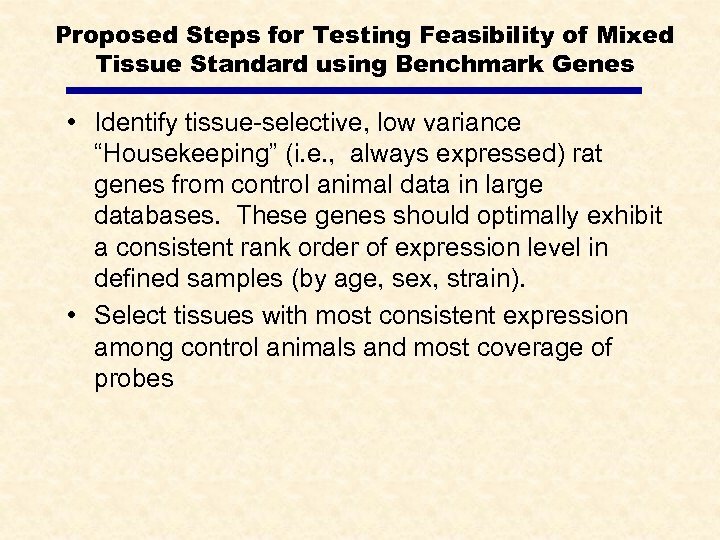 Each animal should be identified with a single, unique number for all the datasets in the entire application. 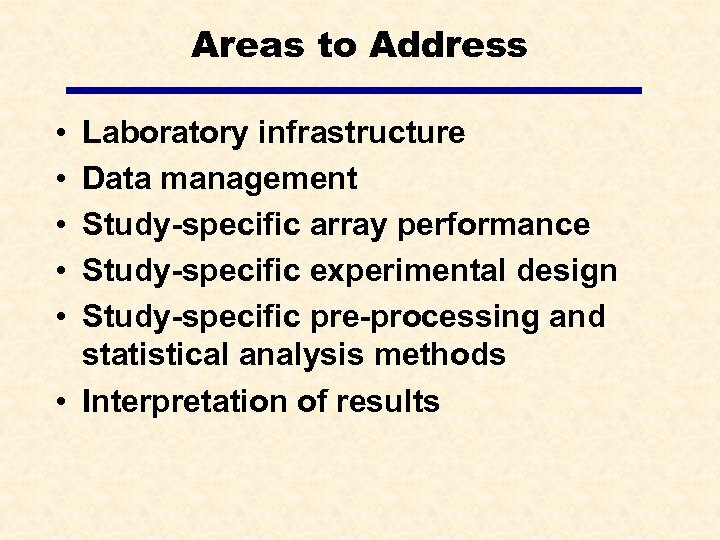 The variable names and codes should be consistent across studies. Provide the duration of treatment based on the start of study treatment. 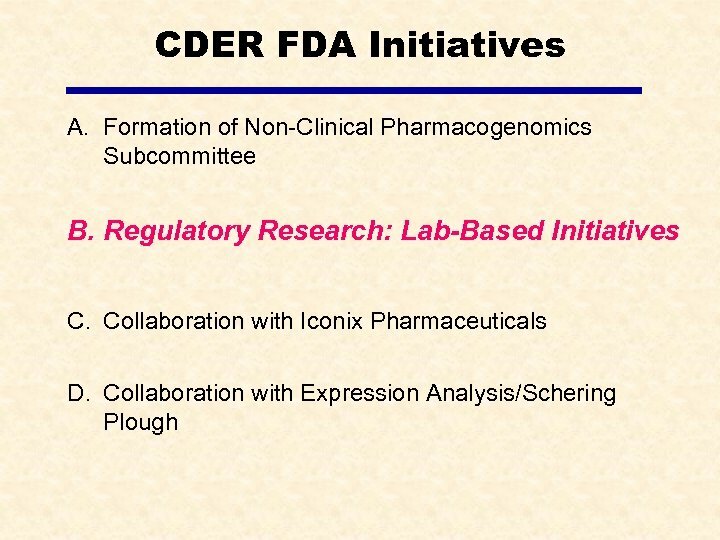 Nonclinical Data sets; Notice of Pilot Project Federal Register / Vol. 68, No. 17 / January 27, 2003 [Docket No. 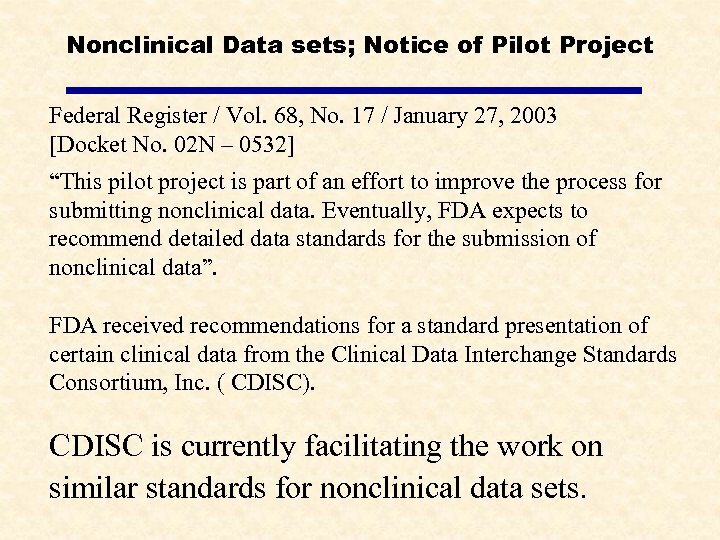 02 N – 0532] “This pilot project is part of an effort to improve the process for submitting nonclinical data. 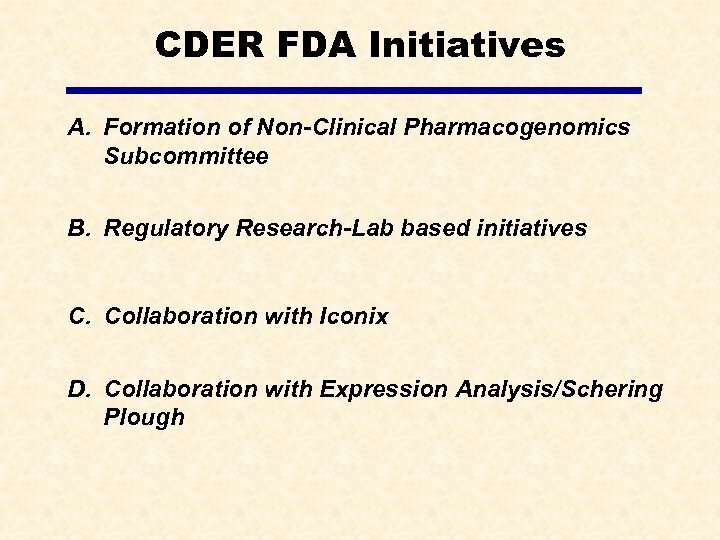 Eventually, FDA expects to recommend detailed data standards for the submission of nonclinical data”. 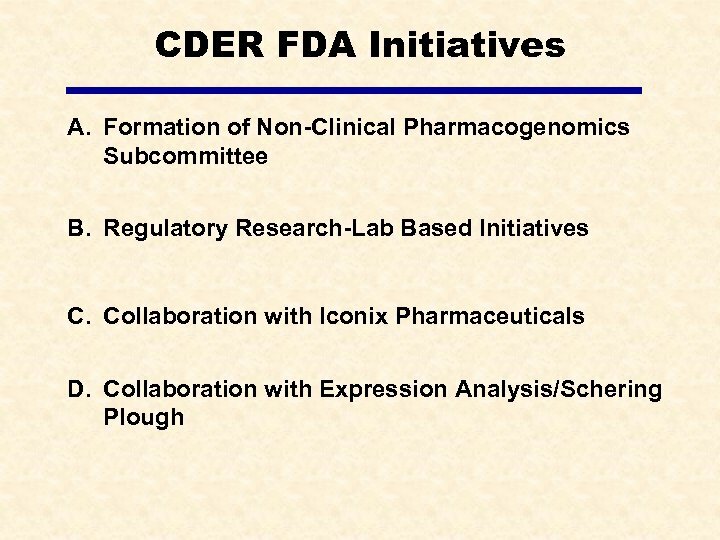 FDA received recommendations for a standard presentation of certain clinical data from the Clinical Data Interchange Standards Consortium, Inc. ( CDISC). 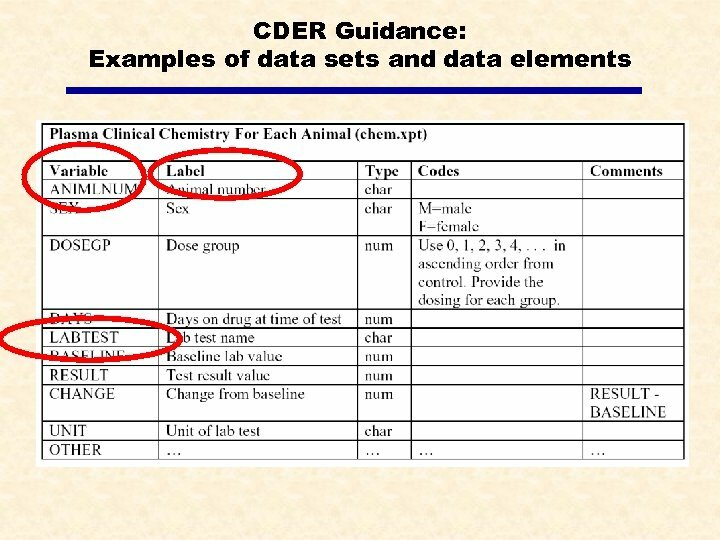 CDISC is currently facilitating the work on similar standards for nonclinical data sets. 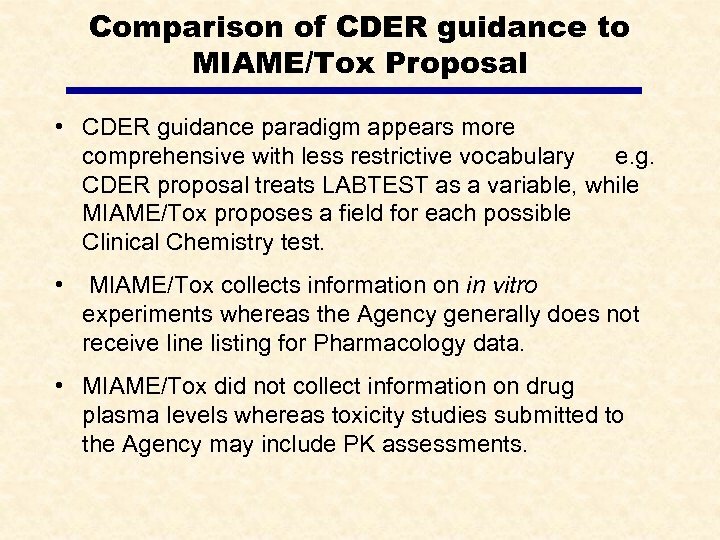 Comparison of CDER guidance to MIAME/Tox Proposal • CDER guidance paradigm appears more comprehensive with less restrictive vocabulary e. g. CDER proposal treats LABTEST as a variable, while MIAME/Tox proposes a field for each possible Clinical Chemistry test. 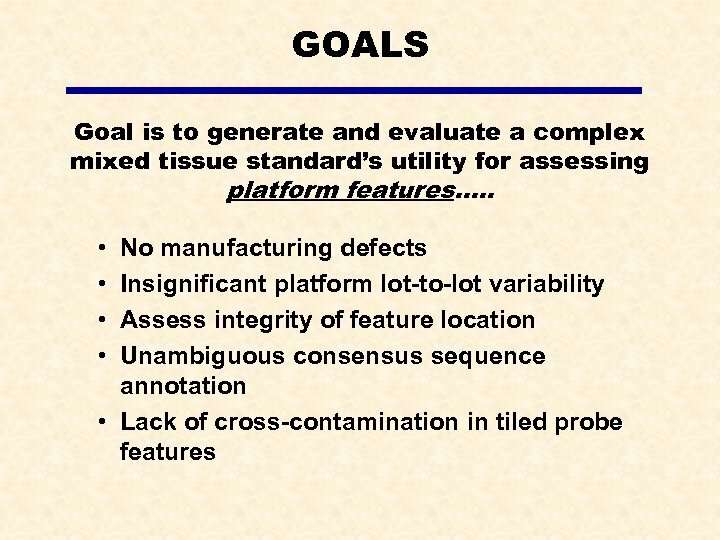 • MIAME/Tox collects information on in vitro experiments whereas the Agency generally does not receive line listing for Pharmacology data. 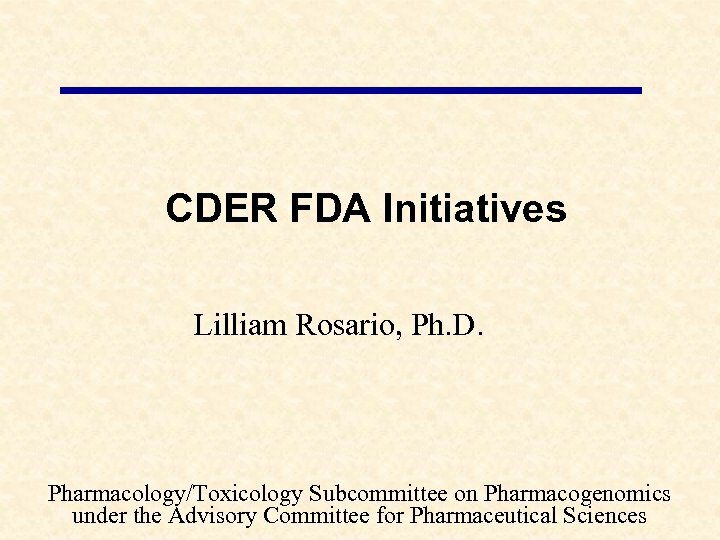 • MIAME/Tox did not collect information on drug plasma levels whereas toxicity studies submitted to the Agency may include PK assessments. 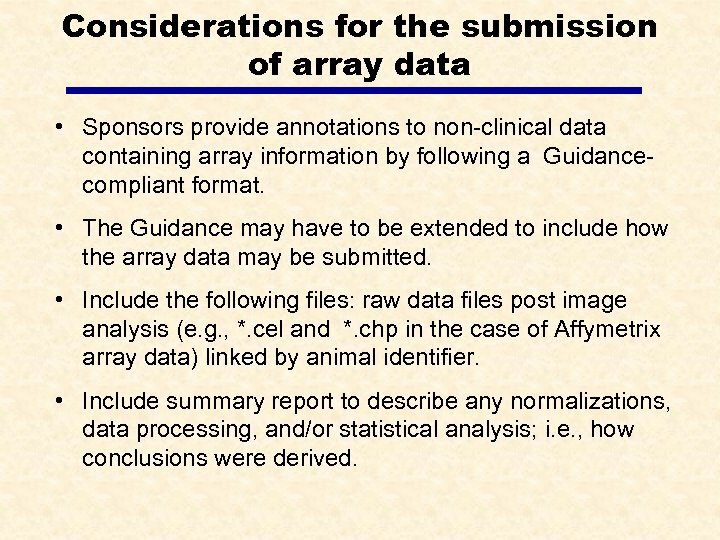 Considerations for the submission of array data • Sponsors provide annotations to non-clinical data containing array information by following a Guidancecompliant format. 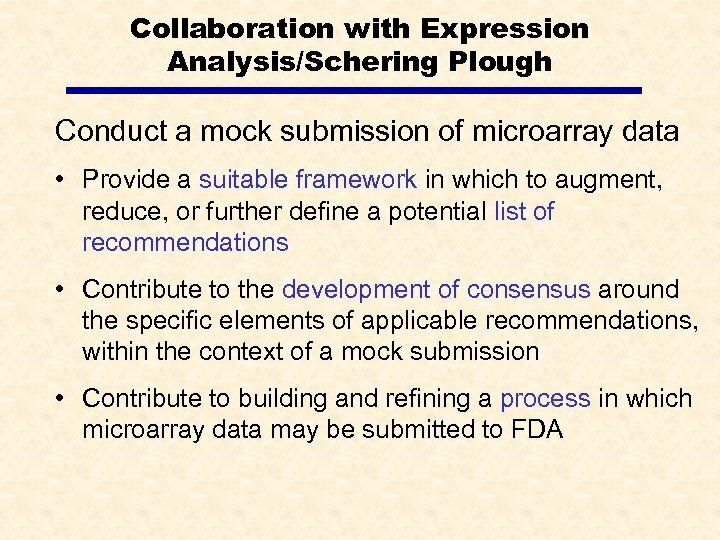 • The Guidance may have to be extended to include how the array data may be submitted. 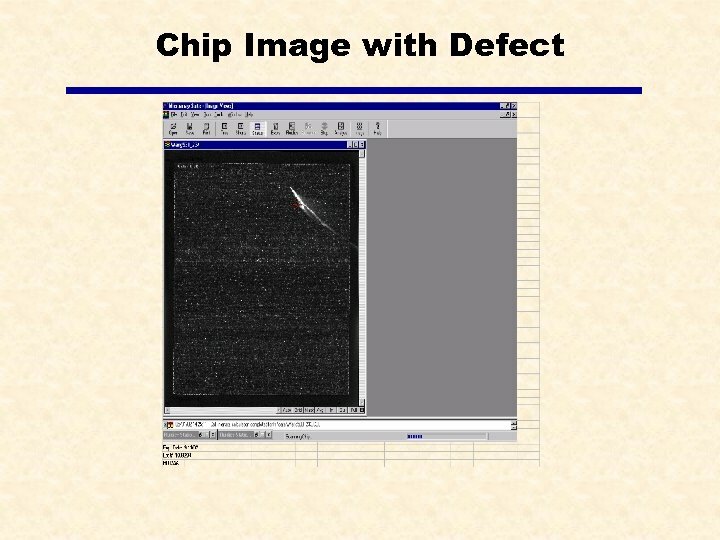 • Include the following files: raw data files post image analysis (e. g. , *. cel and *. 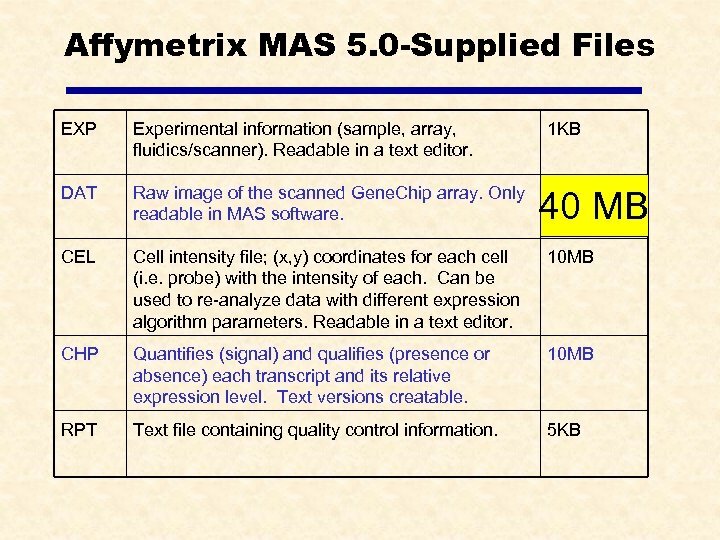 chp in the case of Affymetrix array data) linked by animal identifier. • Include summary report to describe any normalizations, data processing, and/or statistical analysis; i. e. , how conclusions were derived. 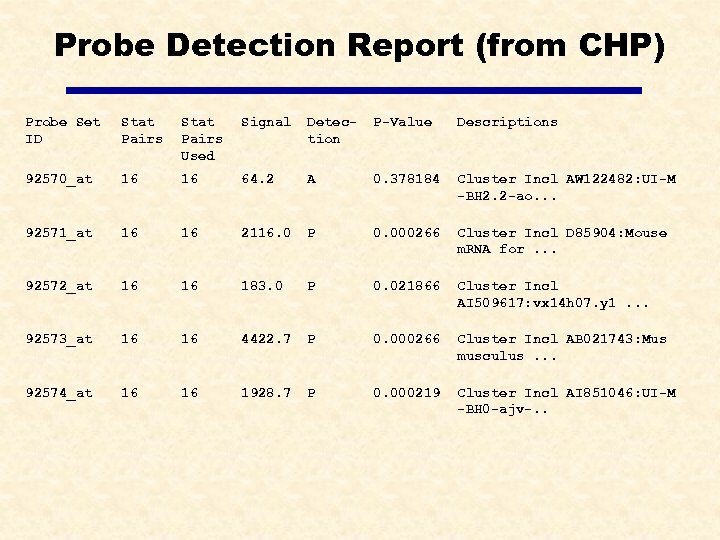 Probe Detection Report (from CHP) Probe Set ID Stat Pairs Used Signal Detection P-Value Descriptions 92570_at 16 16 64. 2 A 0. 378184 Cluster Incl AW 122482: UI-M -BH 2. 2 -ao. . . 92571_at 16 16 2116. 0 P 0. 000266 Cluster Incl D 85904: Mouse m. RNA for. . . 92572_at 16 16 183. 0 P 0. 021866 Cluster Incl AI 509617: vx 14 h 07. y 1. . . 92573_at 16 16 4422. 7 P 0. 000266 Cluster Incl AB 021743: Mus musculus. . . 92574_at 16 16 1928. 7 P 0. 000219 Cluster Incl AI 851046: UI-M -BH 0 -ajv-. . 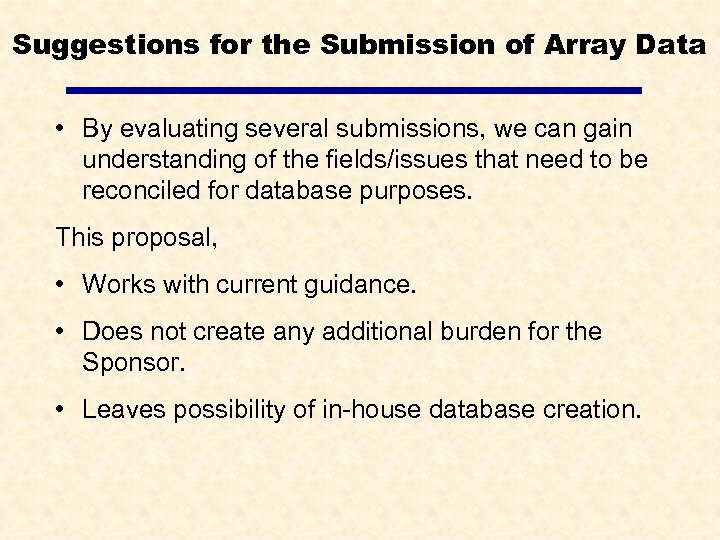 Suggestions for the Submission of Array Data • By evaluating several submissions, we can gain understanding of the fields/issues that need to be reconciled for database purposes. 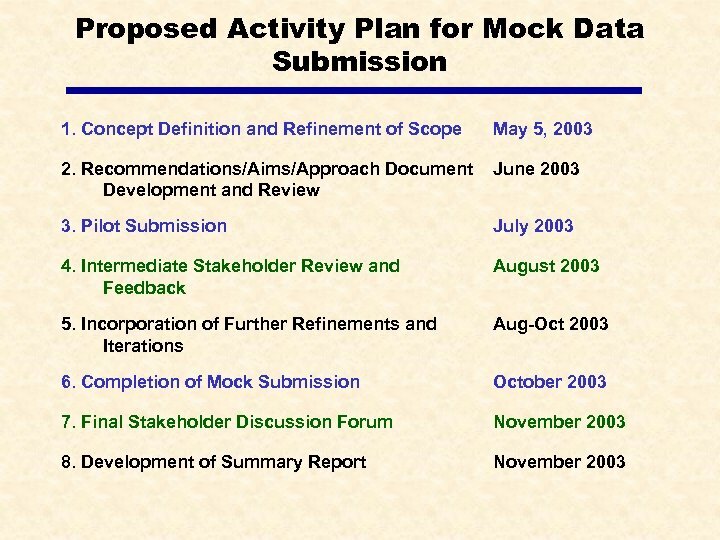 This proposal, • Works with current guidance. • Does not create any additional burden for the Sponsor. • Leaves possibility of in-house database creation.